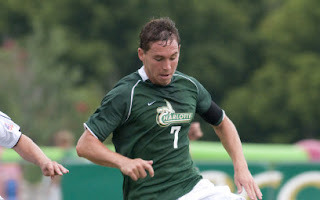 Adam Gross scored the 49ers first goal of the season but it was not enough as the Charlotte 49ers men’s soccer team dropped its season opener, 3-1, at rival South Carolina on Tuesday night. The Gamecocks' Blake Brettschneider scored his first goal of the season on a shot in the six yard box off a Jeff Scannella assist giving the Gamecocks a 1-0 lead in the 30th minute. South Carolina pushed its lead to 2-0 with a 49ers own goal in the 50th minute. Gross scored the 49ers' first goal of the season off a deflection on a 49ers corner kick in the 78th minute. Gross’ goal was the 10th of his career. The 49ers finished the game with a 13-6 advantage on shots. Gross led the 49ers with a game-high five shots. Charlotte plays again Friday at 7 p.m. at Elon.